This delightful creamy corn casserole will truly “spice-up” your dinner entrée! And it’s so simple and easy to make! 1. Spray an 11×7-inch (2 quart) casserole with cooking spray. 2. In a large bowl, combine the soup, diced tomatoes and green chilies and corn. Pour into prepared casserole. 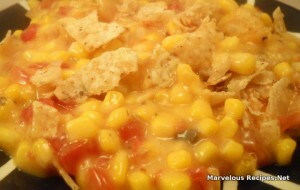 Sprinkle crushed tortilla chips over the corn mixture. 3. Bake at 350 degrees F for 30 minutes or until hot and bubbly. Makes 6 servings. That looks really different from anything that I’ve made. I bet it would be good topped with cornbread!